“Modular Synthesizer Videos Are the YouTube Rabbit Hole You Won’t Want to Leave” says this article on Pitchfork, and we have a hard time disagreeing. Blinking Lights is a space for short intermissions. Things grabbed from the internet. Short and shiny. Few words leaving space to more pictures and sounds. This fist Blinking Lights brings you episode four of a podcast by Nuun on radio.computer dedicated to modular music. #INSTANTBONER are Joe Steyer and Matthias Millhoff, two musicians and producers from Berlin, Kreuzberg. They believe that modular systems and improvised electronic music are a perfect fit for the dance floor. The duo works with a combination of modular synth (for melody, basslines, drones and vocals; this is Matthias’ part) and a computer-based drum machine (Joe’s part) and prefers to create their music live on stage than in the protected context of the studio. On the 1st of May 2015 we had our first official show in Berlin. In the following year we worked a lot on our setup and tried to make it as flexible as possible but also establish a significant sound within this flexibility. We were never trying to work on tracks in the studio, we decided from the beginning that we want to be a real live act, create everything on stage, with the pressure to deliver something to the people. We tried to play as much as possible, mainly around Germany. This year we played again on the 1st of May at the same spot and this time it was streamed by Be-At TV [ed. link is below]. It’s really fun for us to play a set, the vibe and the venue influences us from set to set and we try to create something special every time. Their video Instantmotion was born as a way to explain what they do in their live shows. […] we got many questions about what we actually do with all these knobs, lights and cables. To give some answers we put together a short video which we believe speaks for itself. […] The sound you experience is actually the simple patch you see in the video. Only the Hexinverter Mutant Bassdrum is not visible but is triggered by the very first cable plugged into Pamelas Workout. The hihat is a noise from the FMVDO with MakeNoise Maths envelope 2, the bassline is played by the Doepfer Dark Time into Verbos Complex Oscillator and Manhattan Analog SVVCF with the TipTop Z4000 Envelope. The Pad is the mighty OP-1 shaped by Maths envelope 1. Modulation of bassline and hihat are coming from the QuadLFO. The Reverb is Z-DSP with the Valhalla-Card and is also modulated by the QuadLFO. And finally the Mixer/VCA is the ADDAC Quintet Mixing Console. This time, the new cover photo is one of my own creations. This shot was originally intended to be used for one my band’s gig posters (www.kvsu.net), but then we went with an illustrated version instead. 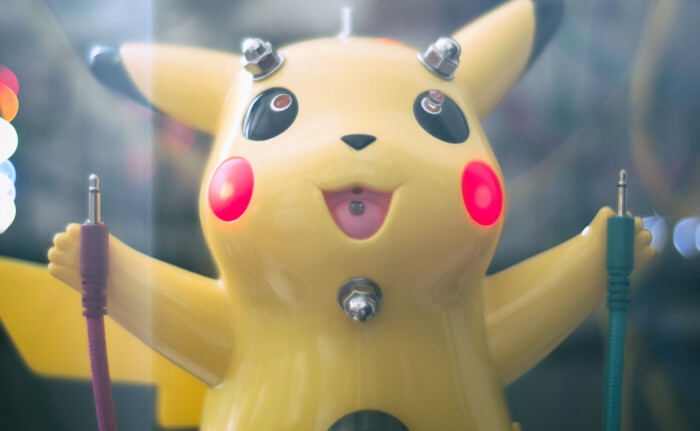 Since I really like this photo and the Pikachu is holding some patchcables (plus, there’s a modular in the background, though you can hardly tell), I decided to use it for our blogzine instead. This bent Pikachu was made by the great Japanese circuit bender Kaseo.